Experience the astonishing journey to the kingdom of delectable cultural food and rum samples. Whether you are a returning visitor or planning your first visit, you have come to the right place for a unique island tasting tour. 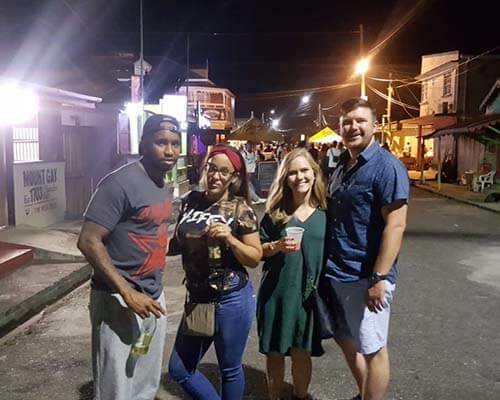 We now present to you the opportunity to explore your cravings by putting together some of the island’s best local food and rum spots to give you that true local flavor. 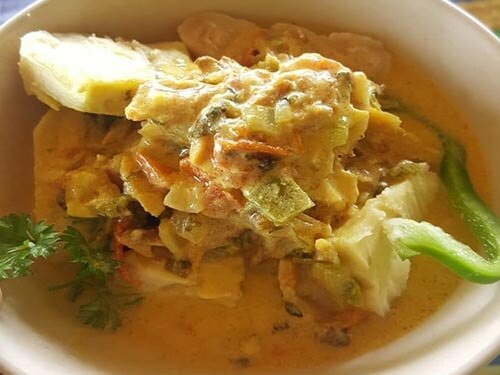 Foods of particular interest are St. Lucia’s National Dish, Breadfruit, Cassava bread, homemade Cocoa Tea, Spice Rums, Local St. Lucian Rums and many other local dishes you are guaranteed to fall in love with. Open to the public, this tour include sightseeing so you will be viewing many towns and villages. The fun begins with our awesome guides who will ensure a safe and enjoyable experience. 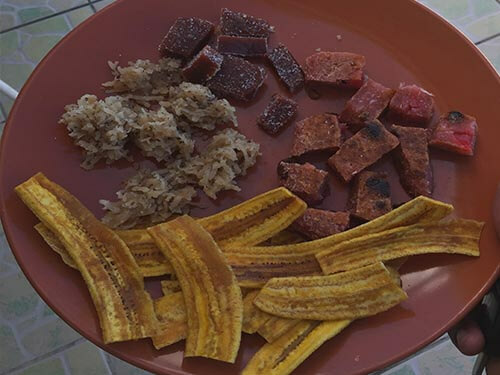 St. Lucia’s National Dish, Breadfruit and salt fish dish, Cassava, Hot Bakes and Cocoa Tea, Island Stew Pork, Local Chocolate, Raps, Plantain Chips, Coconut Candy and more! Local Spice Rums (aphrodisiac! 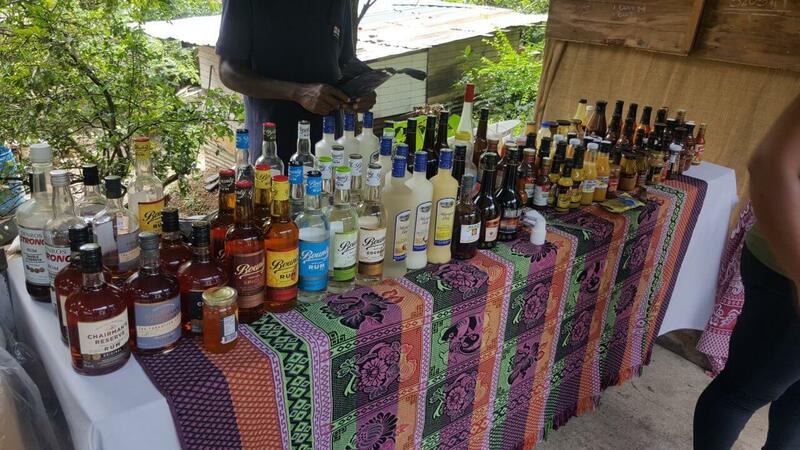 ), Cherman’s Reserve, Bounty Rum, Fruit Flavored Rum, Piton Beer, Sugar Cane Juice, Seasonal Fruit Juice and more! You will get to visit one of St. Lucia’s famous breweries and many towns and villages. 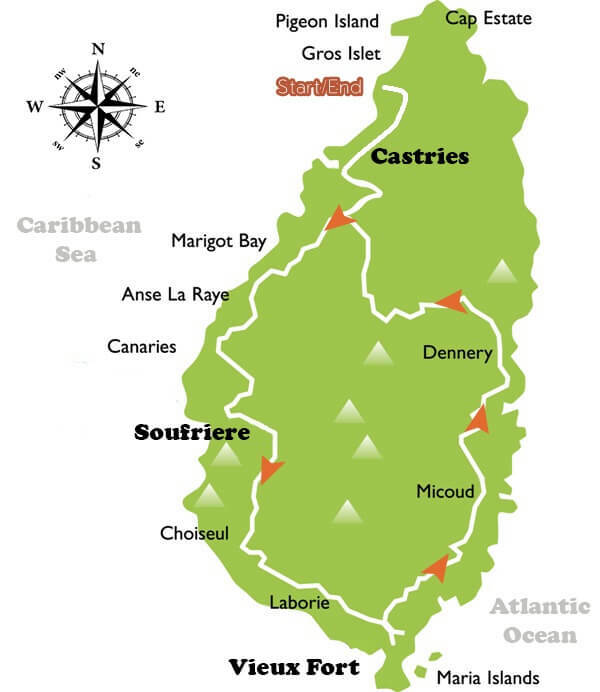 You will get to see the majestic pitons, Mount Jemie Peak, Marigot View, Morne Fortune View, Canaries View, Soufriere View, Laborie View, Dennery View and more! 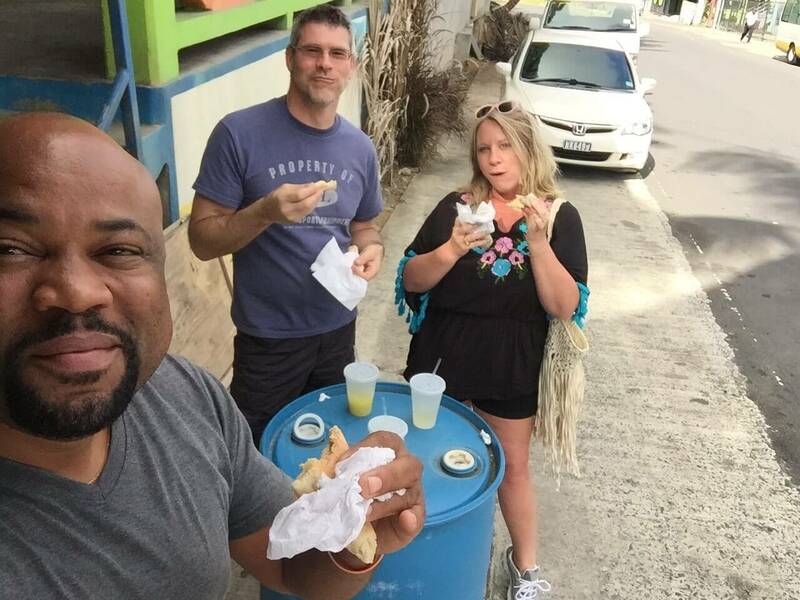 Food and rum tasting extends too many locations around the island. Our tour is more than just a tasting tour. You will also get to bask in the ambience of many scenic views around Island. See local island living! Your food tour will be private unless notified otherwise. 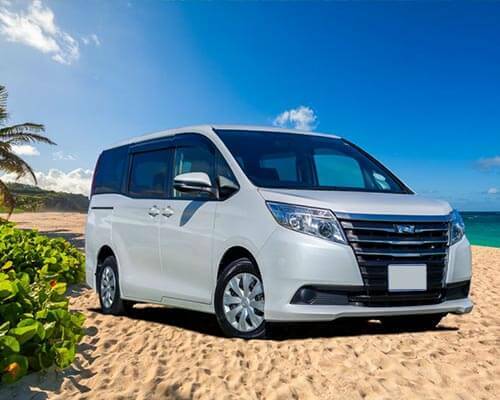 If two couples were to book on the same day at the same location, you will be notified via email about the conversion to group tour. Food Tour starts originally at the Tent restaurant on Vigie Beach next to the George FL Charles Airport. Tour will start at original start point if your pickup location is in the north of the island otherwise, your tour will start at the nearest food point outlined in our route. Since it’s a round island tour you will still get to enjoy most of the tour stops. We offer free pickup or drop to or from your home or hotel. Free pickup and drop from and to the cruise ship are included. Tour will start in original location (vigie beach). Unless notified otherwise, tour will start at 8:00 am from original start location or from your home/hotel. Our Food and rum tour usually takes five to six hours however this is very flexible based on your preference. We allocate sufficient time at every point of interest to allow a full tour experience so nothing is left out. Our professional guides tailor your tour based on your time restrictions to ensure safe return to your cruise terminal. Our tour is available on Tuesdays, Wednesdays, Thursdays, Fridays and Saturdays. We do not operate on Mondays nor Sundays, due to the closing of major tasting points. Food and Rum Tours are available on holidays which fall within our available days Tuesday – Saturdays. NB: All additional tours are open every day..
At this location, you will get to enjoy hot bakes and coco tea at “The Tent” restaurant on Vigie beach. A perfect way to start your day with a nourishing light breakfast! The cool breeze and tropical beach front, will keep you relaxed with a positive jump start. You will get to spend approximately 20 to 30 mins at this spot. Restrooms are available at this stop. Experience the breathtaking aerial view of the Capital City! You will have the opportunity to take great pictures of the city from the top of the mountain at Morn Fortune. At this very same location you will get get a sneak pic at the official residence of the Governor-General of Saint Lucia. You will get to spend approximately 10 mins at this spot. At this food stop location you will either be visiting Glamity's Bar or Antilla's Brewery. 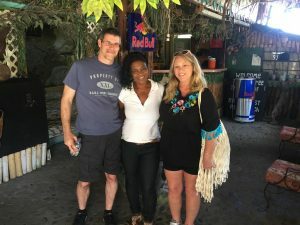 Glamity's Bar is available on Wednesdays and Saturdays where you will be sampling foods such as Island style Grilled Pork or blood pudding with local sides and island beverages. 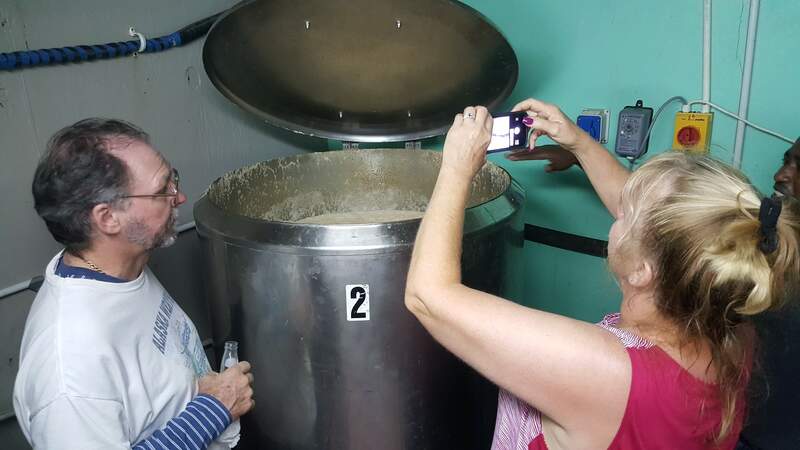 On Thursdays, Antilla's micro brewery allows tours for visitors to experience how they produce there unique beverages. Duration for this stop is about 15 - 30 mins. Marigot Bay is a historic landmark, having been the site of a number of battles between the French and British navies. The inland portion of the bay forms a hurricane hole, used to shelter boats from hurricanes. The bay was used as the setting for the 1967 film adaptation of Hugh Lofting’s Doctor Dolittle books. Scenes of the shipwreck, Great Pink Sea Snail, and the construction of the harness for the Giant Lunar Moth were filmed in the bay. You will get to spend approximately 10 mins at this spot. Taste freshly picked bananas at the banana plantation in Roseau and visit St. Lucia Distillers for rum tasting/Distillery Brewery Tour . Our guides will educate you on how bananas are cultivated, the plantation’s history and learn more about our rum production. You will get to spend approximately 10-15 mins at the banana plantation and 20 - 50 mins at the Distillery. 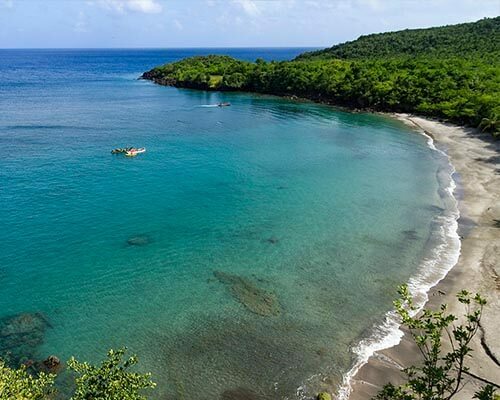 The name Anse la Raye is derived from the rays that are found in the bay, the English translation means Bay of Rays. Two rivers flow into the bay, these are the Grande Rivière de l’Anse la Raye and the Petite Rivière de l’Anse la Raye. On a Friday night there is a fish fry where the local fishermen showcase their skills. You will get a chance to sample fish fritters or stewed pork with an assortment of home made spice rums(usually called local Viagra). We have discovered top secrets at the Horizon Bar where spices fruits and herbs are left to ferment in alcohol for a specific period of time resulting in enriched and distinctive flavors. You will get to spend approximately 20 mins at this spot. Restrooms are also available at this stop. Get your cameras ready for scenic views from both Northern and Southern approaches of “Kanawe” (french creole name). The name Kanawe is derived from the Amerindian word for cooking pots, in the past Canaries had a large sugar plantation that ran inland up the valley that stretches in an eaterly direction from the village. 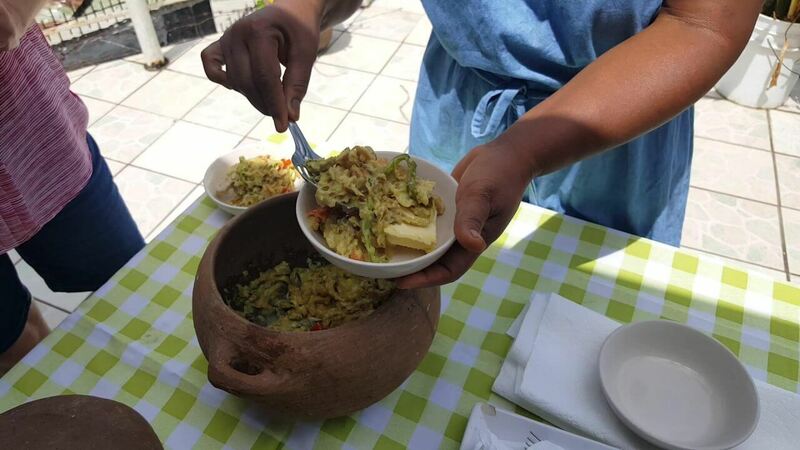 For 15 - 20 mins you will get to taste our National Dish (green fig & salt fish), breadfruit and salt fish with coconut curry, Plantain Chips and authentic Lucian snacks such as Tamerine Balls, Guava/Ginger Fudge and Goose Berry Jam at Del's Rain Forest Cafe. 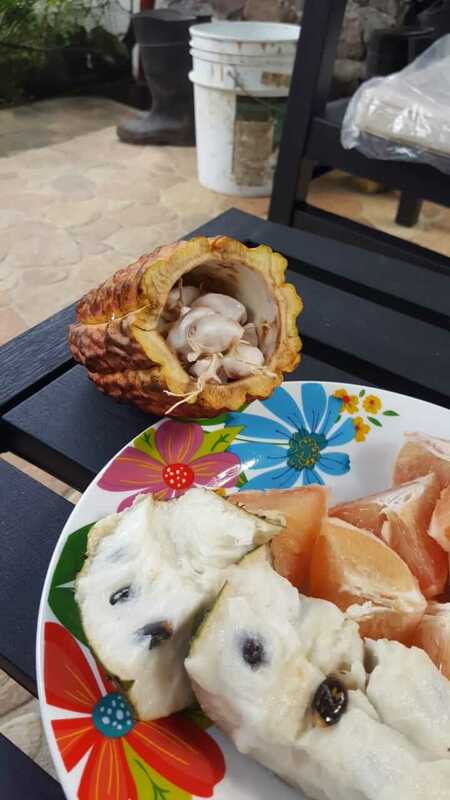 Optionally, you will get to visit Cacoa Sainte Lucie where organic chocolate is produced owned by a local resident named Maria. Taking advantage of the many cocoa plants gown in St.Lucia, she has hand-crafted a series of different chocolate bars. The method used to produce these chocolates brings out a unique flavor you will fall in love with. Be intrigued by Canaries finest chocolates! You will get to spend approximately 20 mins at this spot. 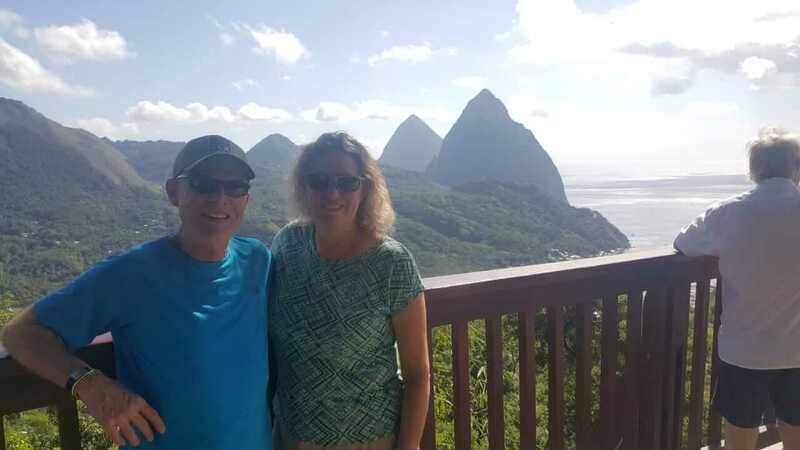 Bask in the ambiance of the Pitons ( Gros Piton and Petit Piton) which are two giant volcanic plugs located south of Soufrière and is a UNESCO World Heritage Site. 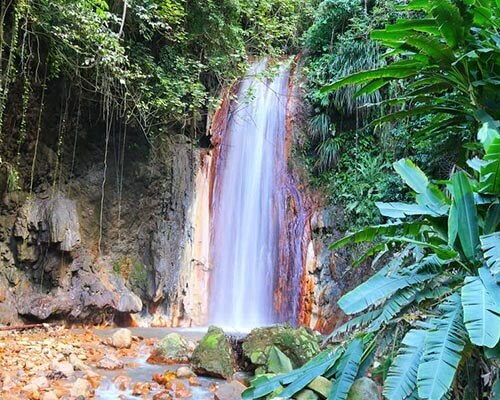 Soufriere contains many exquisite attractions such as the drive through Volcano called the Sulphur Springs, Rain forest, Nature trails, Estates, beaches and famous resorts like Anse Chastanet and Ladera. Tasting at Toney & Aldona's Retreat! 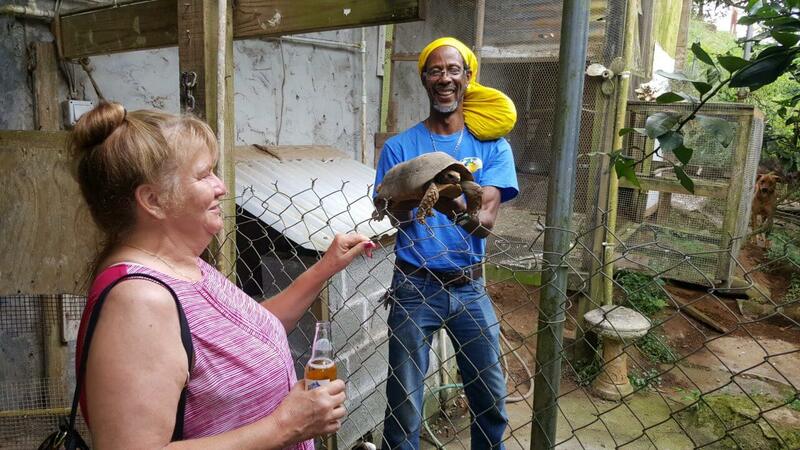 Meet Rastafarian Tony and his wife Aldona as they take you around their quaint estate away from civilization. This location features various local home grown fruit samples and an intriguing overview of Rastafarianism. You will be introduces to an entire new kingdom of natural living. 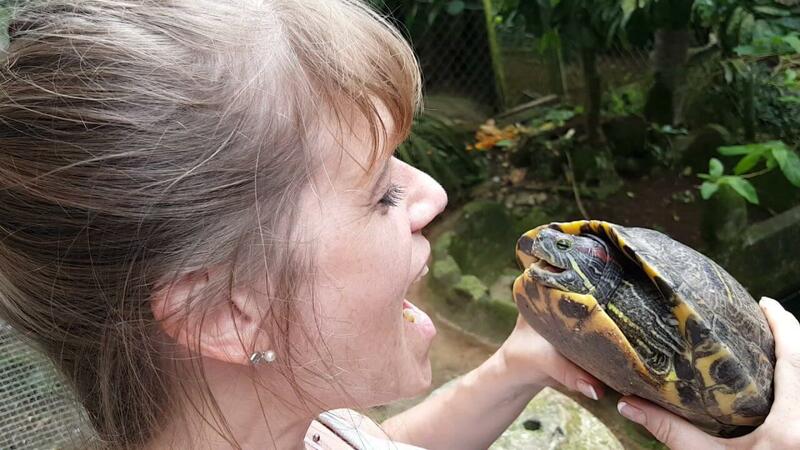 Turtles, Turkey, Chickens and a few other animals are all part of the scenery. 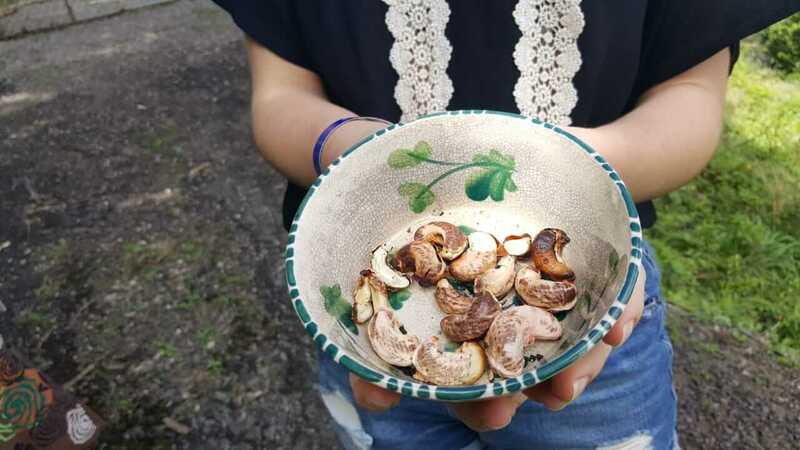 You will engage in roasting cashews the traditional way! 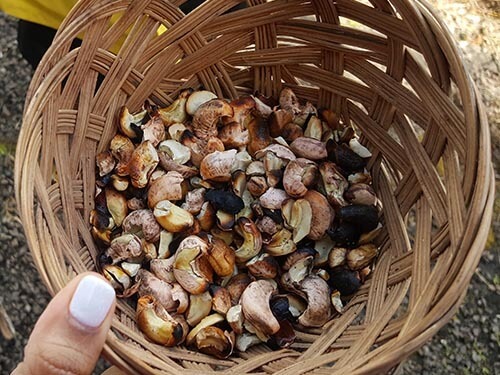 The cashews are harvested and roasted over wood fire. Refreshments will be served while the cashews are being roasted in your presents. The outcome will amaze you for it taste different from what you find in grocery stores. It has that roasted smokey flavor most customers love! You will get to spend approximately 20 - 35 mins at this spot. Restrooms are also available at this stop. Laborie is a south western fishing village named after the French governor Baron De Laborie was once a turtles habitat. French colonials were probably the first to settle what is now the village of Laborie, in the early 18th century. You will get to spend approximately 10 mins at this spot. Vieux Fort is a beautiful town named after a fort that used to watch out towards Saint Vincent towards the south. 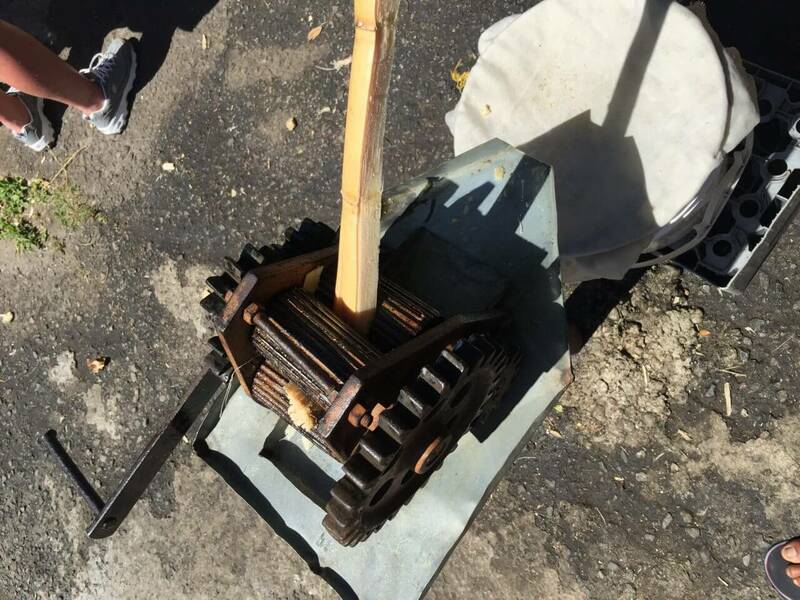 In the 18th and 19th Centuries it used to be an important center of the sugar industry in Saint Lucia before that industry declined. 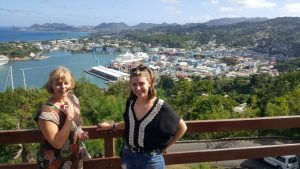 Today, it is the main point of entry for Saint Lucia and also has a port just to the south of the town. 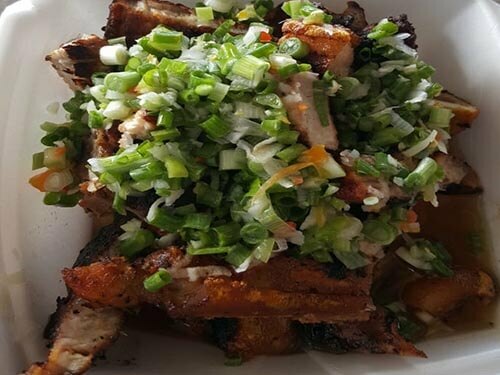 Enjoy a visit to a popular side-road bar in the South, Grill n Chill! 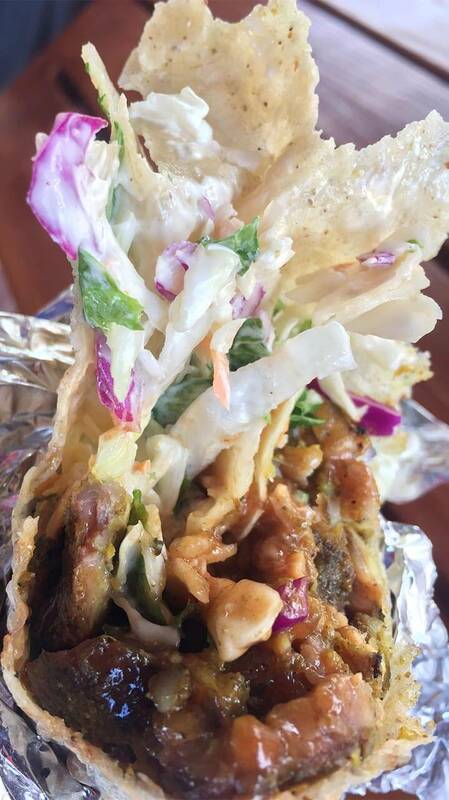 You will get to sample chicken wraps and a unique twist to grilled pork along with local sides. Many other options are available for purchase at this location such as fish, one pot meals octopus and more! You will get to spend approximately 15 - 20 mins at this spot. Enjoy Stone Oven Bread. Experience how bread was baked centuries ago. Before modern stoves were created, stone ovens was the most popular method of baking bread on the island. 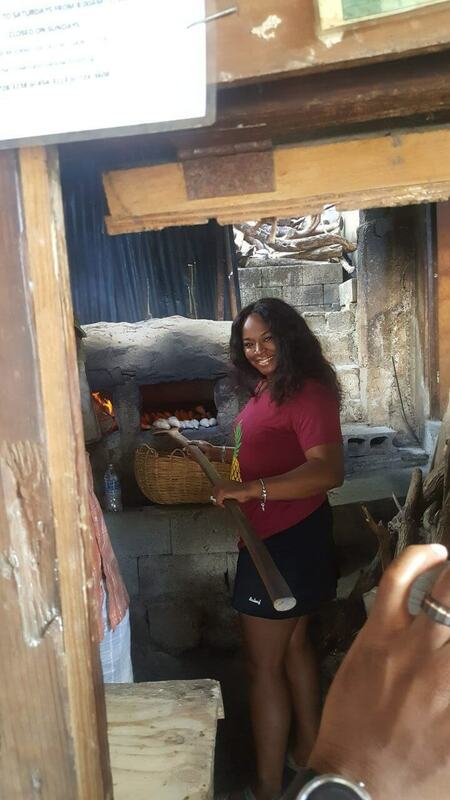 In Dennery village, you will taste stone oven bread straight from the hot oven. The bread will be served with cheese along with the option local refreshments upon purchase. Preview tour food and rum samples. Preview Tour Route. 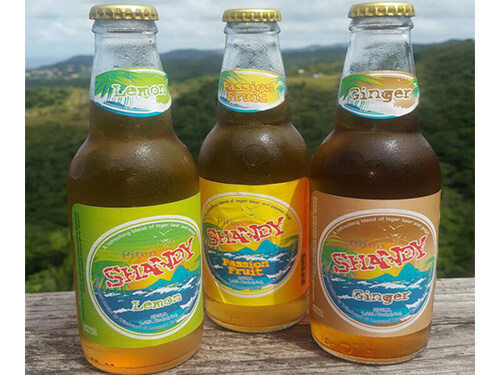 Join the island tasting bonanza! 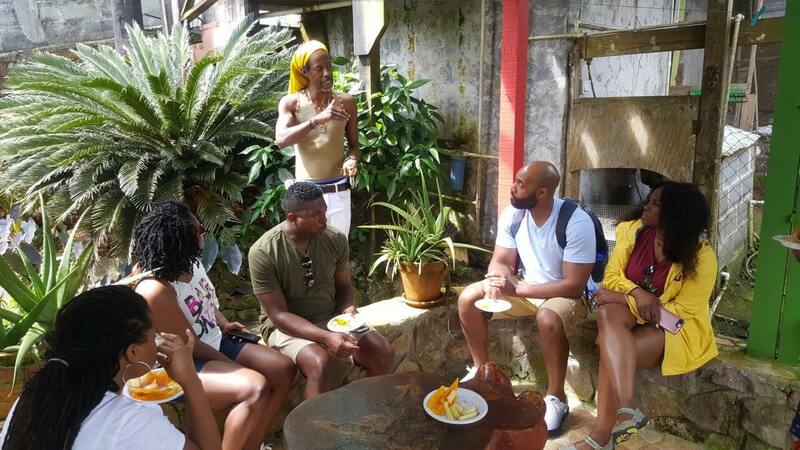 Preview moments at our unique food and rum tasting tour! Start your day like a true Lucian with a healthy hot glass of Cocoa Tea. 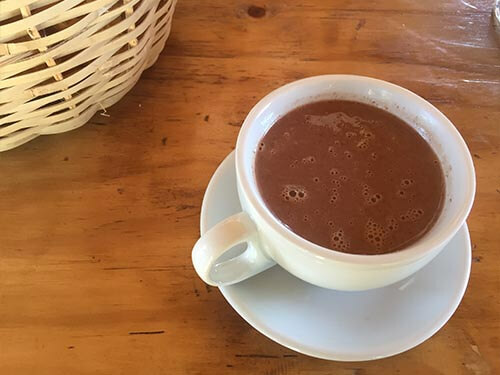 Although it is referred to as a tea, its characteristics are similar to milky hot chocolate, with a healthy twist. Its texture is less fatty and creamy, more fragrant with dark cacao nut and bitter sweetness, plus some warming spice such as nutmeg, cinnamon, star anise and bay leaf, simply magic in a glass. 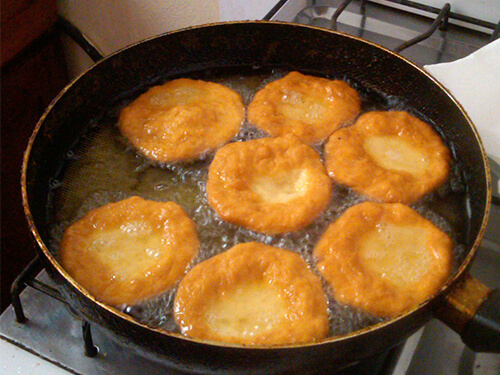 Yes, these babies are fried, even though they are called Bakes. We also call them Float, which is probably a better name as they puff up and float to the surface once they hit the hot oil. 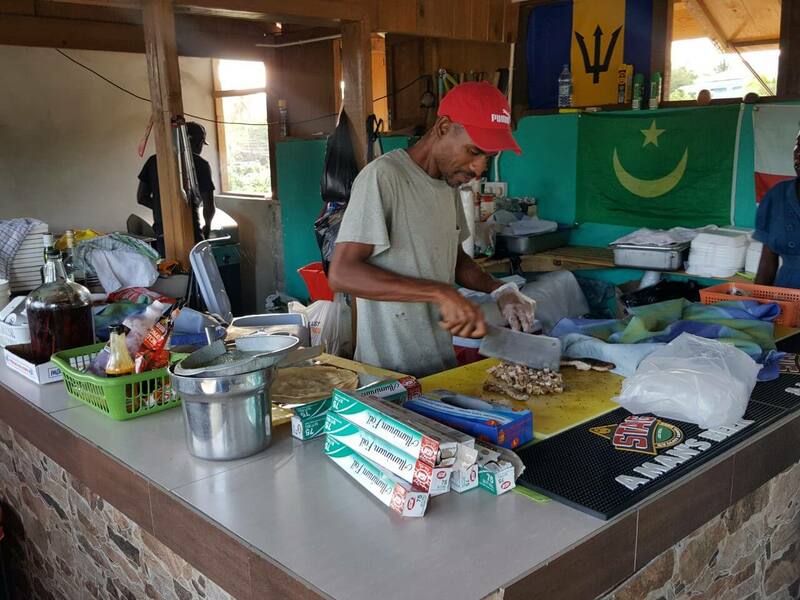 Bakes are a very popular item among the food vendors on the island. You will find them being made at practically every festival, family gatherings, at the beach, in the market, or sometimes even randomly along the side of the road. 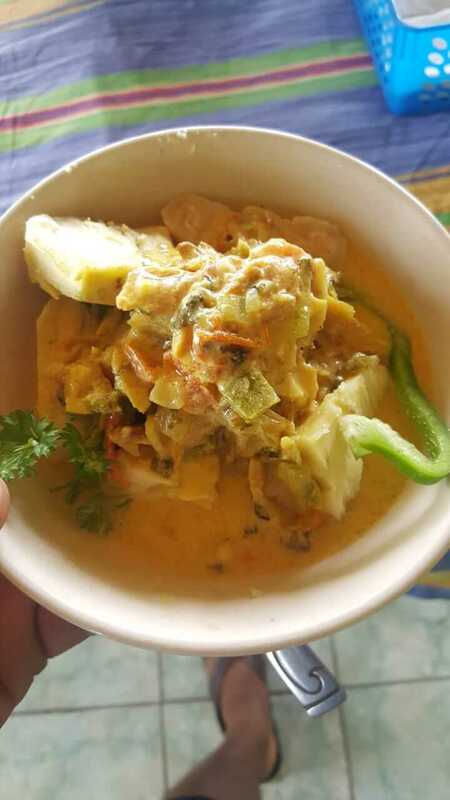 An alternative to our national dish is breadfruit and saltfish. 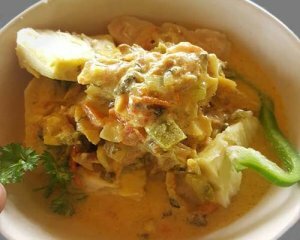 Prefered by many, this dish has coconut curry source mixed with codfish and secret spices/sesononings. 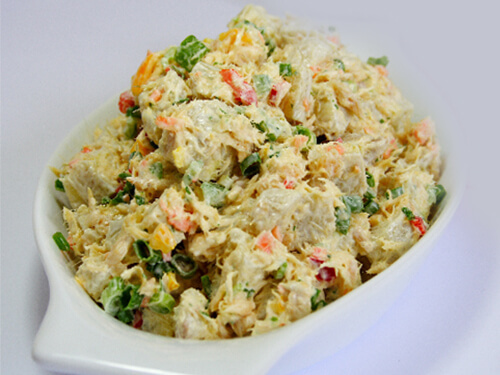 This tasty mixture is then spread over half-ripe breadfruit which completes the famous dish to give a burst of flavor. 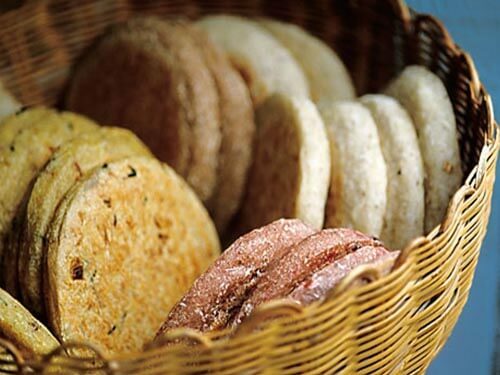 Taste some localy prepared treats of St. Lucia! These treats include casava bread, fried plantain Chips, temarine balls, gwava fuge, ginger fuge, goose berry jam and more! 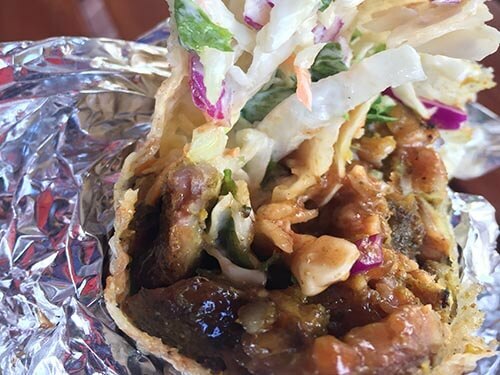 Taste the St.Lucia version of chiken wraps! 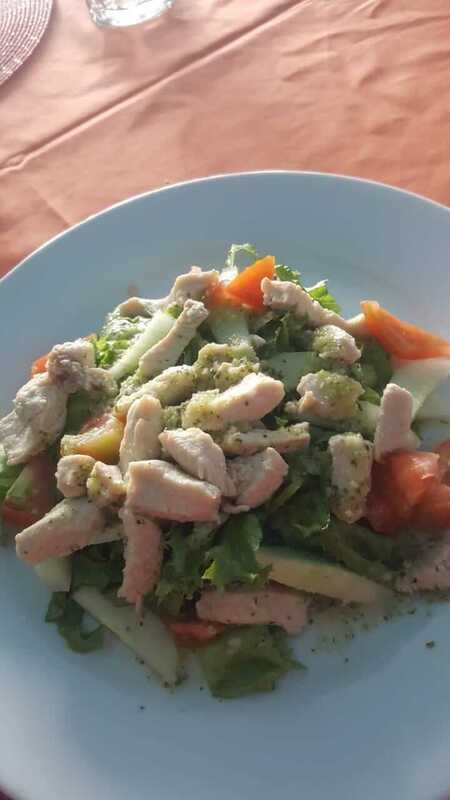 All ingredients are localy produced making it healthy and tasty. The secret sources used makes it irristable for a second bite! 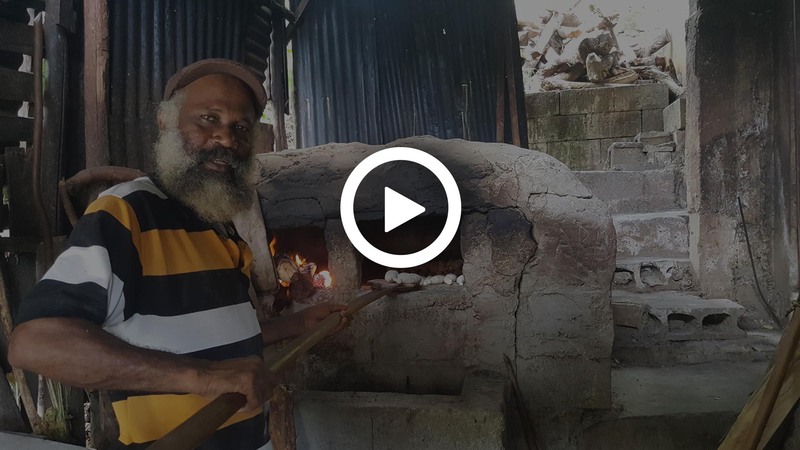 Cassava bread is one of St.Lucia's traditional dishes made in metal pots where it is heated and dried over a charcoal flame. It was known to be traditionally salty, however today many variations has been invented to incorporate sweetness with a combination of raisins and cherries. 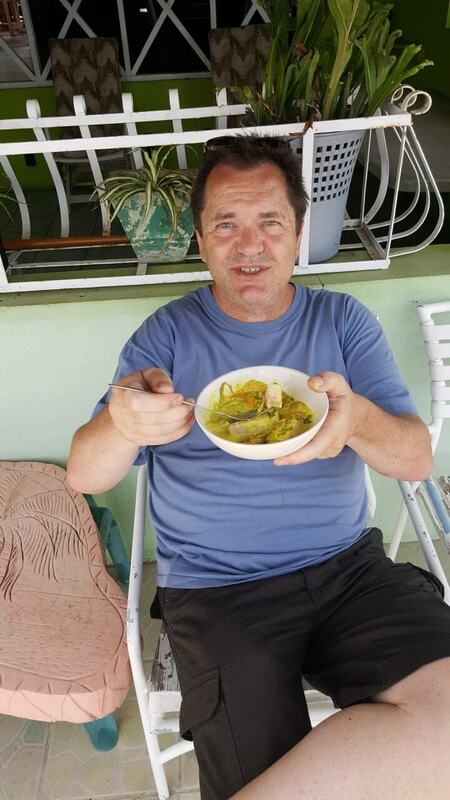 You really need to taste how awesome it is prepared here in St.Lucia. You're gonna love it! 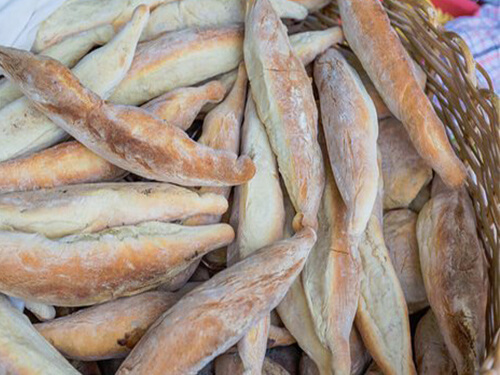 Taste a different version of bread , taste local stone oven bread! Before modern oven stoves were built stone ovens were one of the most popular methods of baking bread. You now have a chance to taste what bread used to taste like way back in the fifties. Customers favorite part of the food tour is to be engaged in local live roasting of Cashew Nuts. 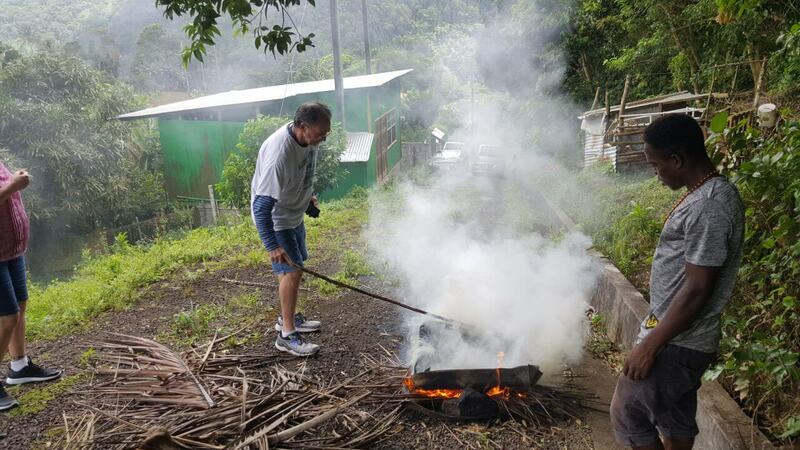 The Traditional method will be used where the cashews are roasted over natural fire. It taste nothing like the usual cashews in the grocery stores. They taste fresh and smoked! 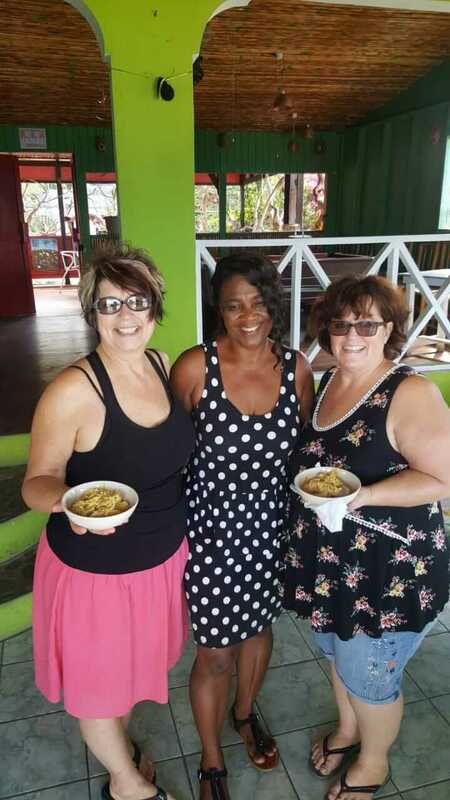 Along your tour you may sample some island stewed or gilled pork. Cooked to perfection with the right amount of heat and seasoning, our version of pork will amaze you! Get your chance to taste these goodies. Get a taste of our locally grown fruits! Unlike all year round fruits such as Jelly Coconuts, periodically changing fruit selections will be available to you based on your arrival date to the island. 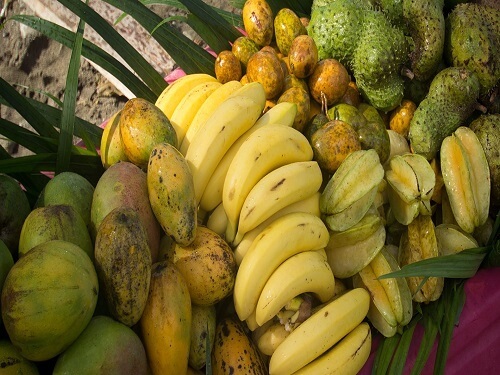 Local fruits such as Soursop, Sugar Apple, golden Apple, Starfruit, local Bananas, mangoes and many more variations you might not have heard about. 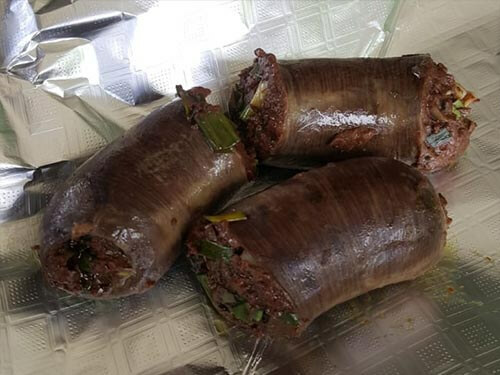 One of St. Lucia's bizarre foods is the Blood Pudding. Taste better than it sounds is bassically pork blood socked and cooked with island spices and seasoning. 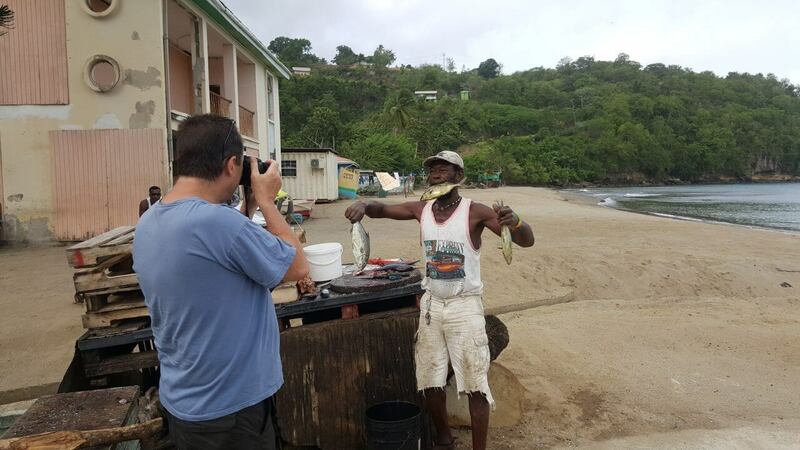 The taste will amaze you which is highly favored by the locals of St.lucia. 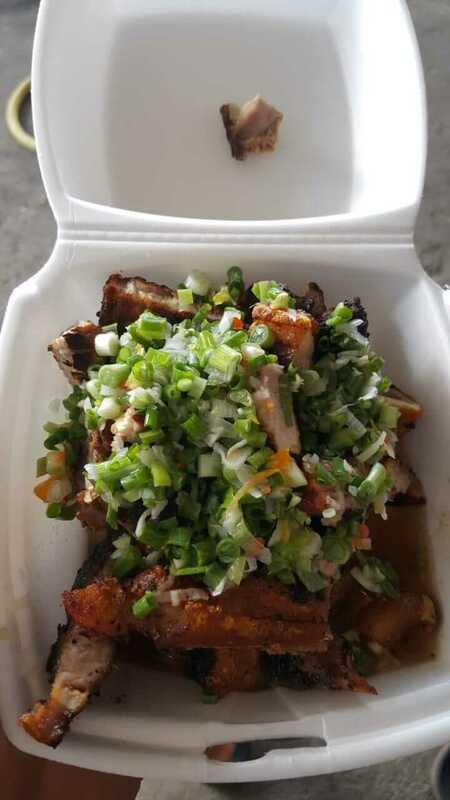 Additional food items such as grilled, stewed or fried fish, chicken, octopus and many more unique menu options may be available for purchase at the allocated tour venues. 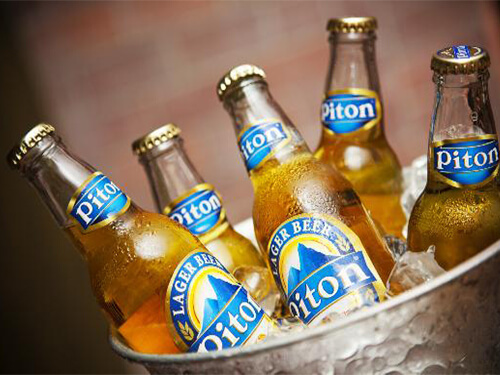 Enjoy the refreshing local beer of St.Lucia Piton Beer! 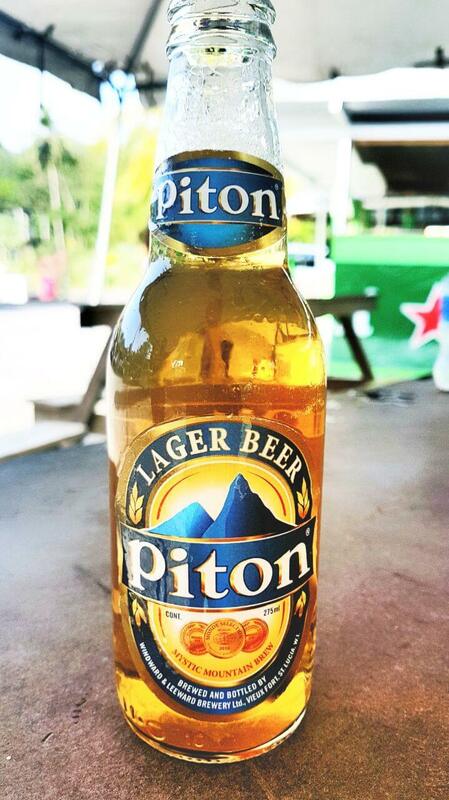 The beer was named after the major landmarks Gros Piton and Petit Piton mountains located in Soufriere. Get refreshed under the hot sun with Del's Rain Forest Cafe Rum Punch! Taste the burst of flavors this one drink has to offer. The rum is mixed with several local spices and local pure juices making it suitable for both women and men to enjoy. No one does it better than Del's Rain Forest Cafe! 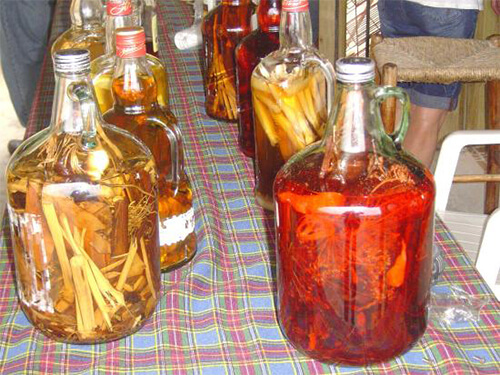 Enlighten yourself with an assortment of home made spice rums (usually called local Viagra). The rum is made of various spices, fruits and herbs which is left to ferment in alcohol for a specific period of time resulting in enriched and distinctive flavors. You will get to sample up to 9 different rum variations such as Pineapple, Mango, Cherry, Ginger, Turmeric, Tamarind and many more! Enjoy a refreshing shandy which contains only 1.2% alcohol! 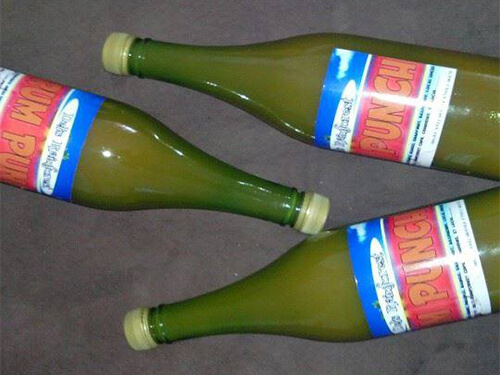 Perfect for light weight drinkers, this beverage comes in flavors such as ginger, passion fruit, lemon and sorrel. This drink will keep you wanting more! 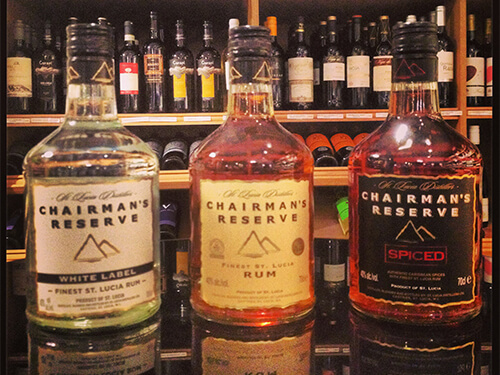 Taste a variety of local rums from St Lucia Distillers Group! Rums like Chairman’s Reserve Spiced which contains local spices and fruits including cinnamon, clove, nutmeg, vanilla, coconut, all spice, lemon and orange. 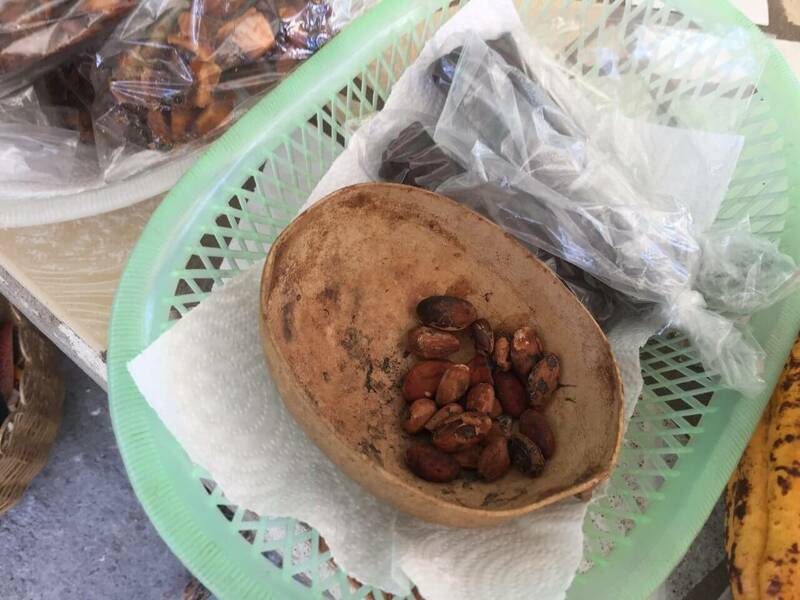 They have also added Richeria Grandis – known locally as “Bois Bande” – a bark renowned in the Caribbean as a potent aphrodisiac to give an added kick to the rum. Ennoy our localy produced beverages , Antillia Brewery Samples! 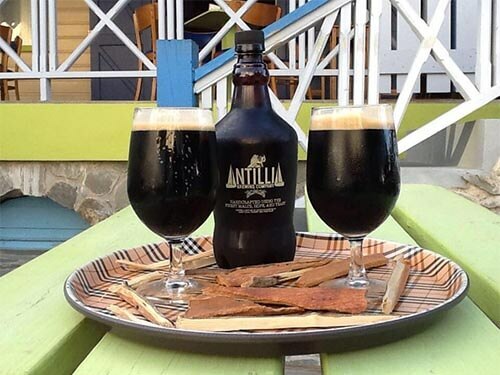 You may get a quick tour of Antillia's Brewery and also get to taste there special selection of alcoholic beverages. Additional local beverages (including non-alcoholic beverages) may be available for purchase upon the various tour routes.